Firefox does not have built in translation feature. When you come across any web page that is not in your native language, Google Chrome ask you to translate the page into the language you can read, that is the feature many peoples miss in Firefox and also a reason to switch from Firefox to Chrome. Google Chrome offers automatic language detection and translation to local language feature, but whenever I am using Mozilla Firefox, I use a Bing Language Translation Bookmarklet that translate the web page every time you call the bookmarklet. The translation is as good as Google translation but still then, it is a boring task. Now it seems to come to an end. 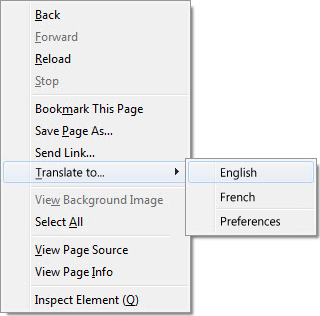 Firefox is working on built in, in-browser translation feature that will work as well as Chrome translation. Whenever Firefox detects a web page other than your native language, will offer you to translate the language into your native language. You can translate it into any other language also. You can either translate the complete web page or part of it. You can select the text you want to translate the context right-click menu will offer you to translate the selection into your local language. This will help you to read the updates you come across while you are on social networking sites and follow some peoples who may update in other languages. If you are a Firefox supporter, this is a one more reason to keep your relationship long with Firefox. Now you do not have to switch to Google Chrome for any reason. But till now the version of Firefox is not confirmed when the feature will be released. You can find more about the feature and release schedule here. Its really strange that the Firefox do not have built in translation feature and everyone have to either use Google Chrome or some other extension or toolbar or addon or a bookmarklet. Such a important feature is missing and no one is doing anything and the feature is still not in the list of future update list.